I sewed up a storm last week putting the finishing touches on my Fall 2011 Collection, which is now being shown at various wholesale markets. 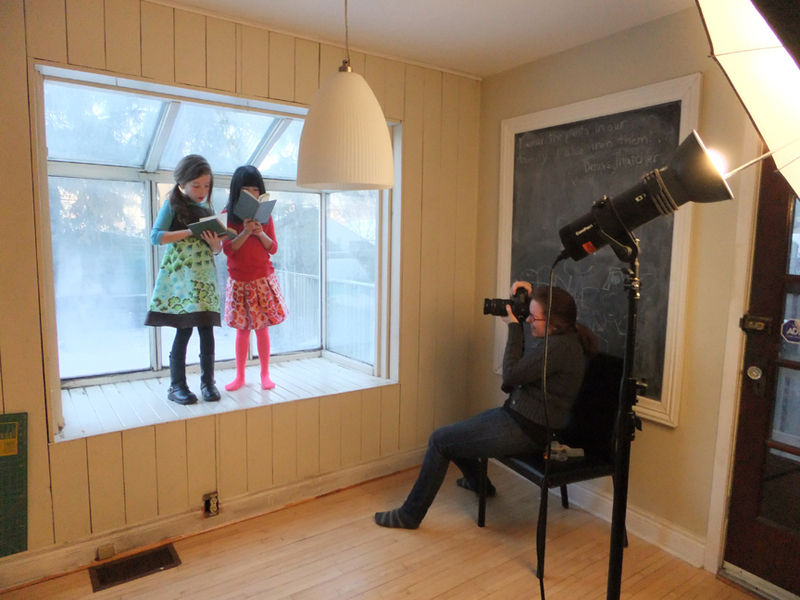 The most fun part of this whole process, of course, is the photo shoot! I work with a great photographer, Lise Varrette (www.lisevarrette.com), and every shoot we do together is better than the last, more creative and satisfying. Red Thread has been photographed in a variety of locations, including a formal photo studio, on the beach, in the park, even the alley behind my house, next to my neighbour’s 100-year-old garage. Last year we photographed my fall collection in my living room, in a makeshift studio. But this time around was a first for me, a testament to the ability of a great photographer to find beauty anywhere. As you can see, I love to shoot outdoors. But this is not an option in February, at least not in Toronto. Lise and I talked about what we wanted to achieve for this shoot, and decided to do it at my house. But when she showed up with less equipment than usual, I was horrified to learn that rather than setting up a little studio in my living room, she planned to achieve the effect we’d discussed by shooting around my house, in nooks and crannies, doors and windows. She’s great at this, transforming ordinary spaces using light. But my house in February, when I’m engrossed in both Spring production and Fall design, is not a pretty sight, the ordinary mess of five busy people compounded by dozens of bolts of fabric, bags of buttons and trim, not to mention the teetering piles of paperwork. Lise transformed my kitchen into a location in a matter of minutes. At first I watched in horror as she did several shots in my large window seat, once a lovely feature but now badly in need of repair, its wooden frames weakening and window glass streaked with moisture, its seal lost long ago. She then started moving around my house, using the windows as backdrops and as sources of glowing natural light. Seeing the photos for the first time, especially those that were shot in the window seat, I was dumbfounded. The glass, cloudy and streaked, is stunning and luminous. I feel gratitude for this gifted photographer who took the pieces I’d worked so hard to create, and presented them in such a beautiful way, while also sharing a part of my home. Thanks Lise!